GET WELL AND GET OUT! Most people will find themselves -- or a loved one -- faced with a hospital stay at some point in their lives. The prospect is scary enough, even without worrying about hospital infections, adverse drug reactions, and other alarming risks that have been documented by the Centers for Disease Control and reported widely in medical journals and the national media. But help is here. Packed with advice that will help people feel better when they are ill and at their most vulnerable, this essential guide provides a reassuring road map for avoiding mishaps along the route to recovery. 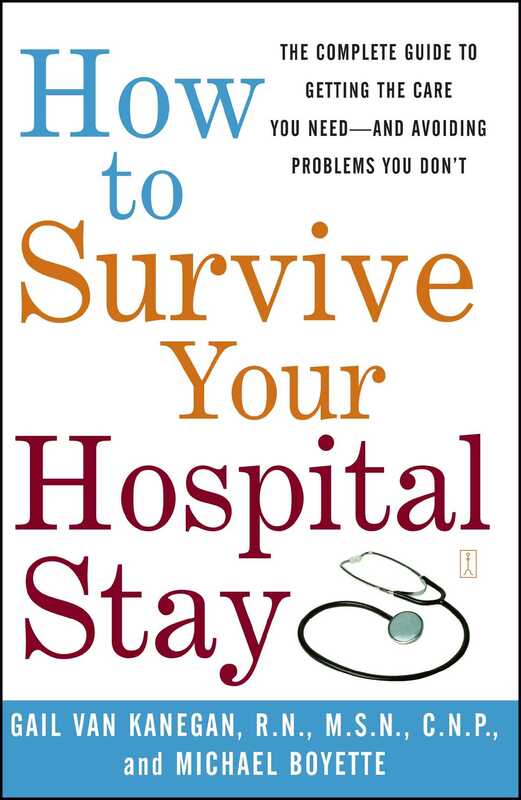 If you or someone you love is going into a hospital, you need this book. Most hospitals work hard to make sure you get the care you need and to protect you from harm. And most doctors and nurses are dedicated, competent professionals, committed to helping you heal. But the modern hospital is a vast, complex enterprise, and there are many opportunities for things to go wrong. The best way to protect yourself is to be an informed consumer. Reliable estimates suggest that, of every one hundred people who go into a hospital, between five and ten will suffer some sort of injury or complication as a result. The Los Angeles Times reports that as many as 180,000 Americans may be killed each year by injuries, hospital infections, misdiagnosis, mishandling, and other avoidable hospital-related fatalities. That's as many people as would be killed if a jumbo jet crashed every day of the year. The Centers for Disease Control estimates that about two million people contract hospital infections in the United States each year -- more than one in twenty hospitalized patients. About eighty thousand people die as a result. That means hospital infections alone rank as the fourth most common cause of death in America, killing more people than auto accidents and homicides combined. A 1998 study published in The Journal of the American Medical Association estimated that one hundred thousand Americans die in hospitals each year from adverse drug reactions. The Centers for Disease Control estimates that as many as sixty million antibiotic prescriptions written each year are unnecessary and potentially dangerous. According to the Detroit News, "one of every five patients who died in the medical intensive care unit at one of the nation's best hospitals was misdiagnosed" by his or her doctor. Keep in mind that we're not talking here about treatment failures -- people who go into a hospital and don't get better. We're talking about new injuries and diseases that people suffer as a direct result of their hospital care: infections they didn't have when they went in, receiving the wrong medications, poor nutrition, misdiagnosis. Nor are we talking about inevitable complications, such as a surgeon performing a delicate operation and damaging nearby organs. Most hospital illnesses and injuries are preventable by following simple principles of good care -- things like nurses and technicians washing their hands between patients, using simple checklists to avoid medication errors, or writing instructions legibly. Armed with the knowledge in this book, you and your loved ones have the power to avoid most of these risks. Hospitals and health care researchers have invested millions -- perhaps billions -- of dollars to discover what the greatest risks are and how they can be prevented. By and large, the problem isn't with exotic equipment or new experimental treatments. It's the everyday stuff. People in a hurry. Or not paying attention because they've done something a thousand times before. Or making assumptions without double-checking. And it's often the same kinds of errors, happening time and time again, that cause the most harm. Of course, hospitals try very hard not to make mistakes and to head off problems. But in any large organization, with so many people doing so many different things, something is bound to go wrong. That's where you and your family have an advantage. You don't have to worry about running the whole hospital, or taking care of hundreds of sick patients. You have to worry only about you. Armed with the right information, you and your family are the best protection against hospital-related injuries and illness. That's the purpose of this book -- to arm you with the information you need, in an easy-to-use format. When you or your loved one is going into a hospital, you don't have time to wade through a lot of research. Nor can we discuss every conceivable risk in hospitals. Some risks are relatively rare and hard to defend against. There are other risks that, frankly, you don't have much control over. But it is possible for you to protect yourself against most of the serious risks that you'll encounter in the hospital. We've identified the ten most serious you'll face during your hospital stay. For each, we offer simple, practical steps you can take before, during, and after your stay to protect yourself or your loved one from harm. Focus on these, and you will emerge from the hospital in better health and better prepared for your recovery. Keep this guide close at hand. Refer to it often. Whether this is your first time dealing with hospitals or you're an old hand, you'll find useful suggestions and ideas that will help you come home healthy. In the pages that follow, we identify practical strategies that can help you remain healthy and avoid risks during your hospital stay. You don't need to be a medical expert to follow them, and they won't in any way interfere with the course of treatment that your doctor has prescribed. Indeed, we urge you to review them with your doctor and seek his or her input. Most suggestions are based on common sense, because that's the best way to stay out of trouble. Most involve making sure that people do what they already know they're supposed to do. Most medical errors occur not because of ignorance but due to neglect. Hospitals are busy, complicated places, often running shorthanded and under difficult cost constraints. If you know what to look for, you can do a lot to head off problems. Your most important tool in this effort is a pleasant but firm attitude. Treat your caregivers with respect and insist on respect in return. We recognize, of course, that it may be hard to be proactive when you're headed for the hospital. You may be in pain. You may be weak or disoriented. Perhaps you're scared. You'll certainly have a lot on your mind already. That's why we suggest that it's best to find a trusted friend or family member who can act as your advocate and help you take the necessary steps. But even if you don't have an advocate, you can benefit from the ideas in this book. Especially in Part 2, we focus on steps you can take yourself -- from your own hospital bed -- to help ensure your safety. Often it's a matter of asking the right questions -- repeatedly, if necessary -- until you get the information you need to make good decisions. Other times, it's simply reminding your caregivers of things they already know and encouraging them to stop and think before acting. By and large, the care you receive in the hospital will probably be competent and professional. Many patients go through their entire hospital stay without being exposed to medical mistakes or undue risks. And we aren't suggesting that you or your advocate has to be on guard twenty-four hours a day. Rather, our aim is to alert you to red flags, so that you can focus your (sometimes) limited energies where they can really make a difference. You may not be willing or able to follow every recommendation we make here. It depends on your individual circumstances -- why you're going into the hospital, how long you'll be there, and what happens while you're there. It also depends on what you're comfortable with. Do as much as you can. Every step you take will help you be that much safer. A couple of housekeeping notes: Though this book is a collaboration, it's written in one voice -- Gail's -- for the sake of simplicity. Similarly, we address the book to you, the patient, for reasons of simplicity and readability. But we're really speaking to your loved ones too. When patients are seriously ill, it often falls to others to look out for their interests. In those circumstances, all of the recommendations we offer can be followed by your family, loved ones, or advocate.